Today I had some time to look into the new Google labs innovation Lively. The idea looks the same old chat rooms of the past with a only new thing seems to be lot of efforts have been put in the look and feel. I agree and think for many that Lively is a waste of time. So far, it is just another 3D chat and nothing more. 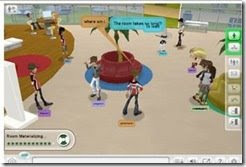 Sure, you can share videos, pictures, and websites, and...play with your avatar and other 3D objects. I think it may have a future in the way the web operates, but there are many other 3D chat competitors to do this as well. Lively's option to embed it in a website makes it stand out from it's competitors, but it may not stand out for long.